Thanks very much to Bill Couch who sent this over, this is a photographic heat map of the geotagged photos of Washington DC on Flickr. This is the just the downtown section, so click through to get the whole view, as it covers the entire metro area. 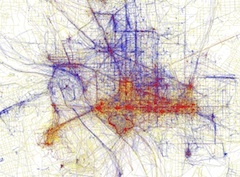 Red dots are tourist shots, while blue dots are from the people that live here. Yellow dots are from people who could go either way. It’s not surprising to see how monument-centric the tourist population is, but it’s very neat to see where the photo lines drop off in Northeast until you see the big cluster at H Street, etc. Spiff.